Altogether 20 kits were manufactured, 16 sold to customers. Among them are three kits are as static FW 190 in museums. The flight work crew assembled FW 190 A8/N (D-FWJS), including all corrections and rework of different systems, for a German customer. The oil cooling system received an additional “ring oil cooler. Combustion air of the Ash 82T is sucked in vertical, behind the engine. To give the copied FW 190 as authentic an appearance as possible a rework became necessary, with the help of the additional oil cooler. Further substantial changes concerned the brake linings as well as a variation in type of the brake pumps, which are installed at the pedals. The first flight of the D-FWJS was accomplished by test pilot Klaus Plasa. The flight testing of D-FWJS and D-FWWC without the use of the flap system for takeoff and landing were accomplished. However the flaps were used in the flight, and a “Lastigkeitsänderung” is clearly noticeable around the transverse axis, which could be well trimmed. The FW 190 test flight report written by Professor Kurt Tank, says when driving flaps and undercarriage “Lastigkeitsänderungen” were not produced. In the FW 190 flight work uses in the house developed fin adjustment devices, similarly those for the use in the ME 262 developed trim actuators. Original devices available, but such systems, e.g. original undercarriage introduction engines and Cyclo transmissions were not used for safety safety reasons. The production of the 40's was shaped by scarcity of raw materials, a large number of these electrical trim engines did not have ball bearings, but only steel sockets, as “emergency substitute solution “. The original drives for the landing flaps this, which was not acceptable for safe flying operation now. Flight testing of the first FW 190A-8/N began in July 2004, and was to continue in 2007 with test pilot Horst Philipp at the controls. At Gammelsdorf in Upper Bavaria, the Flug Werk company unveiled its first long-nose FW 190D-9/N "Dora". Substituting for the original Jurno 213A engine is an Allison V-1710 engine, specially modified by Bud Wheeler's Pennsylvania-based ACE Competition engines. The Allison unit is 500kg (1,1001b) lighter than the Jurno, so to compensate a specially constructed engine mounting has been manufactured from chrome-molybdenum steel. Wheeler has also extensively modified the reduction gear in order to achieve the same propeller speed as the FW 190A-8, so it will be possible to use the same blades as fitted to the radialengined version. Specially manufactured exhaust pipes will ensure that this area of the 190D will look authentic from the outside. Three FW 190D-9s will be built, with the first example going to a Florida-based owner once it is completed. The second aircraft is also due to be exported, but the third 190D will be retained by Flug Werk, together with one of the 1 90A-8s, and be used for display and film work. 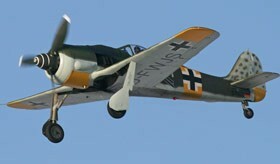 The first of the Flug Werk FW 190D-9/N Doras was handed over to its owner Tom Blair at Kissimmee, Florida, 11 December 2007.